The first Destiny game back in 2014 launched in a pretty rough state. There wasn’t a ton of content, the leveling system was too complicated, and overall Bungie made a lot of weird decisions that contributed to the game not meeting many players’ expectations. 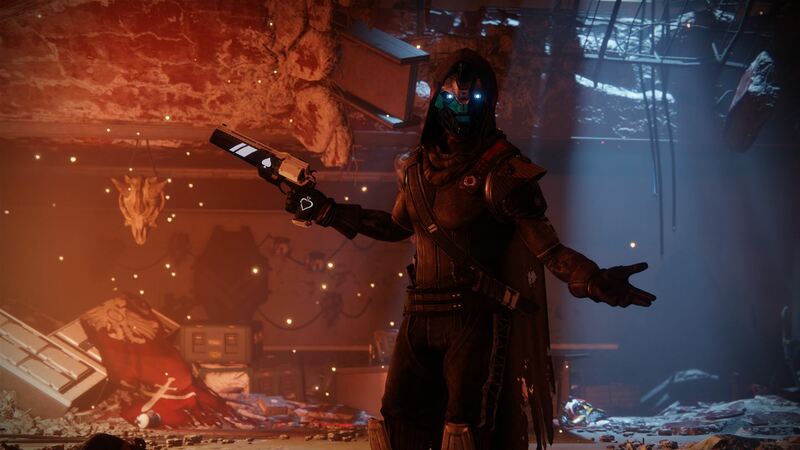 Bungie learned a lot from that and really took player feedback to heart and after the Taken King expansion launched in 2015, Destiny was genuinely pretty darn great. Now, in 2017, a proper Destiny sequel has launched and I am pleased to say that the steady improvements to the core foundation continue over to this new game to create the best Destiny experience yet. Destiny 2 isn’t a wildly different experience than Destiny 1, mind you, but it is far more polished and complete feeling right from the start than the original game was at launch. The result is a fantastic full-featured package that Destiny die-hards as well as series skeptics and newcomers alike will have a great time with. See our full Destiny 2 review for all of the details. I want to start out by saying I am playing and reviewing Destiny 2 as an almost exclusively solo player. I don’t really care for deathmatch in the Crucible that much and only rarely played Strikes in Destiny 1 and never did a raid. I’m reviewing Destiny 2 from the perspective of someone that will only really play solo or co-op during patrol. I know that there are a lot of players like me out there who are probably curious about whether Destiny 2 is a viable game to play solo, so that is what this review will focus on. Spoilers: Yes, it’s awesome even if you’re mostly playing solo. I can only assume it’s even better if you participate in everything Destiny 2 has to offer, but as a solo player I’m more than satisfied. Taking place one year after the SIVA Crisis (from the final Destiny 1 expansion Rise of Iron), Destiny 2 begins with the Red Legion faction of the Cabal launching a full-scale attack on Earth in order to take control of the Traveler. 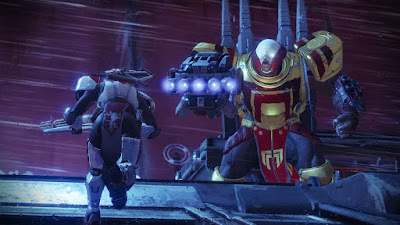 The Red Legion, led by Dominus Ghaul, is successful and manages to capture the Traveler, take over the Last City, and sever the connection between the Guardians and the Light. Without the Light, Guardians are not only severely weakened but can’t be resurrected anymore, which leads to many Guardians dying in battle. Your character manages to get their light back, however, and the story then becomes a quest to reunite the Vanguard (the leaders of the Guardians) in order to organize a counter-offensive against the Red Legion. Oh, and there is a machine that will destroy the Sun that needs to be taken out along the way as well. While the story itself is sort of hit and miss, the campaign missions in Destiny 2 are pretty spectacular overall and easily top almost anything from Destiny 1 in terms of scale and just sheer cool factor. Destiny 1 kind of blew the Solar System’s wad by letting you go to Luna (Earth’s Moon), Mars, and Venus, so visiting less famous places like Io (moon of Jupiter), Titan (moon of Saturn), and the centaur planet (small minor planets in between Jupiter and Neptune) Neesus feels like a bit of a step down, but they all still have some beautiful and interesting sights to see. As I said, the scale of the battles you’ll fight in can be really, really impressive and there are even some Halo-style vehicle sections thrown in that add some nice variety to the missions. I honestly can’t remember very much of the story missions in Destiny 1, but there are several very memorable moments in Destiny 2 that not only stand out, but I actually want to re-visit. 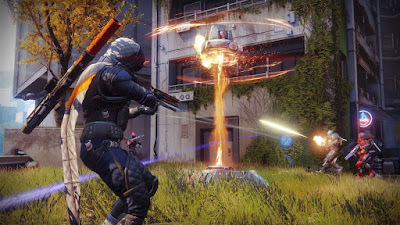 The campaign takes about 8-10 hours to finish in Destiny 2, but will likely take longer since you don’t necessarily have to just plough through it all at once. You’ll almost certainly get distracted with the huge, huge, huge amount of side missions and other content on offer. There are “Adventure” missions that are structured like minor story missions that send you out to complete specific tasks while also filling in story details. These provide some welcome world building that was notoriously absent in Destiny 1. 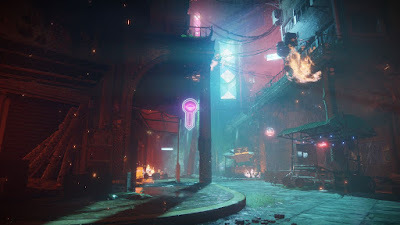 You can also freely explore all of the areas, of course, and they are all filled with hidden treasure chests to find, public events to participate in with other players, and hidden Lost Sectors where you fight through caverns full of enemies in order to unlock a loot chest full of rare goodies at the end. When you reach the current level cap of 20 even more content opens up. New missions become available, you can start trading in faction reputation (that you earn by doing missions on each planet) for new gear, and a ton of other stuff. This is all on top of the content outlined in the above paragraph, plus patrol missions, challenges (this game’s version of bounties) and much more. This isn’t even considering three-player strikes or six-player raid missions. Destiny 1’s biggest problem, for me at least, was that I ran out of content sooner than I would have liked. Destiny 2 solves this by giving you a ton of varied stuff to do long after you beat the story. In fact, a lot of the content isn’t even available until after you beat the story, so it’s going to take a long, long, long time to see everything Destiny 2 has to offer. That’s awesome for mainly solo (and co-op in patrol) players like me. A lot of the content, such as access to patrol missions, strikes, or even the use of the sparrow vehicles, is gated behind level requirements, but I don’t think this is a bad thing. Some call it a “grind” to unlock them, but I think that’s crazy talk. Grinding, to me, implies playing the same content over and over, which you absolutely don’t have to do in Destiny 2. There is so much content available that there is no reason whatsoever to have to re-play anything. You just find something new to do and level up naturally. Anyone who is complaining about grinding is just looking for an excuse to complain about something. The core gameplay in Destiny 2 is some of the most impeccably great first-person-shooting the genre has to offer. 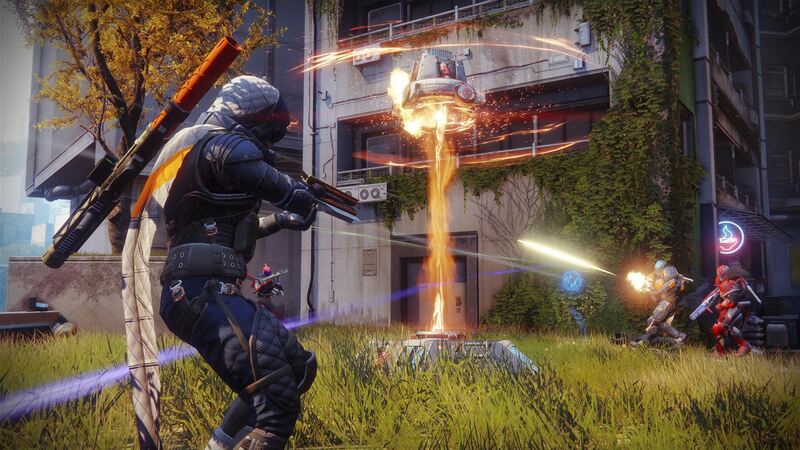 The game just feels incredibly good to play and the wide variety of weapon types and abilities that each class and subclass has access to means there are a ton of ways to play. Bungie are FPS masters and that continues with Destiny 2. I also have to give props for how good the movement and occasional platforming feels in Destiny 2 as well. You have a sort of booster-assisted double jump and can briefly fly and float around and it feels really precise and quite good. A lot of the time platforming in first-person is awkward or even objectively bad, but the movement in Destiny 2 feels great. My only real complaint with Destiny 2 is in its use of microtransactions. With real money you can buy new sparrows, ships, weapon and armor mods, and custom armor shaders. Now, normally cosmetic items don’t bother me much as microtransactions, but they are implemented in a somewhat questionable way in Destiny 2. Armor shaders – to change the color of a piece of armor – are now one time use consumable items that can only be applied to one piece of armor. In other words, to have a full set of armor the same color you have to use multiple shader items. Granted, the game does give you a lot of shaders for free (especially after you reach level 20), but the coolest ones have to be purchased and it all feels really slimy and gross. The premium weapon and armor mods are more problematic as they aren’t just cosmetic and can actually give you a competitive advantage, though admittedly somewhat minor at this point, by boosting stats and offering other benefits. Gross. Just, gross. On a much more positive note, the presentation in Destiny 2 is absolutely spectacular. No longer hamstrung by also having to appear on last-gen hardware, Destiny 2 was made with Xbox One, PS4, and gaming PCs in mind and it looks absolutely gorgeous. Right from the start of the campaign the game shows off new visuals and special effects that wouldn’t have been possible in Destiny 1 and it is incredibly good looking. 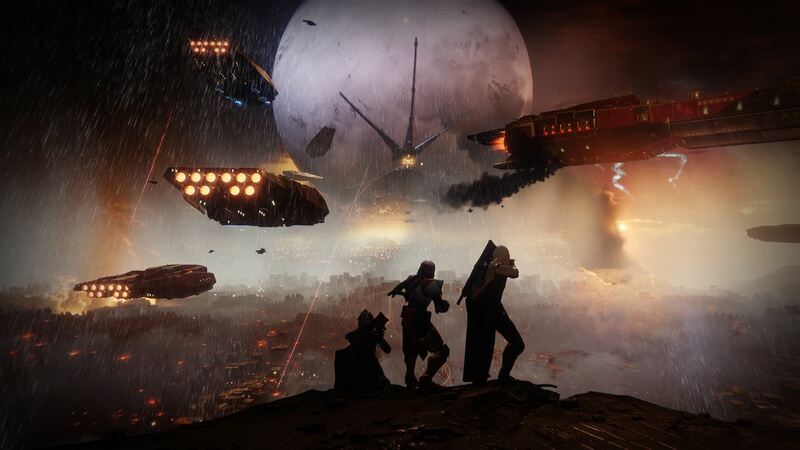 Pair the great visuals with dozens of enemies fighting on a massive battlefield, and the framerate never budging an inch, and Destiny 2 is all the more impressive. Equally as stunning is the incredible soundtrack. The music is just pitch perfect and matches every scene and planet and mood and battle absolutely perfectly. I fully expected to like Destiny 2 – I spent a good 200+ hours with Destiny 1, after all – but I didn’t expect it to be this much better. With a better campaign, improved presentation, and greatly increased amount of content, Destiny 2 is simply outstanding. It plays so good and has so much to do that there is little question that you’re getting your money’s worth this time around. It is a great multiplayer game, great co-op game, and, yes, a great solo game if that’s how you want to play. Destiny 2 has far surpassed my expectations and is a game I can see myself playing for quite a while, which makes it very, very easy to recommend. Buy it. Disclosure: A review code was provided by the publisher, Activision.